The Radiology Department at Fulton County Health Center offers exceptional depth and quality in imaging services. From a full complement of traditional radiology and imaging capabilities to advanced technology such as Magnetic Resonance Imaging (MRI), Computed Tomography (CT), nuclear medicine studies and bone densitometry, we are making state-of-the-art diagnosis and treatment convenient for residents of Fulton County and surrounding areas. All services are available on an inpatient and outpatient basis along with having 24-hour coverage by a radiologist and technologist. All equipment features the latest technology. This area includes many of the services that you would typically associate with radiology: diagnostic and routine x-rays and fluoroscopy (upper and lower GI studies), and IVP or Intravenous Pyelogram (kidney) studies and Mylelograms. The specialized technologists in our Ultrasound area offer routine abdominal and obstetric/gynecological studies in addition to cardiovascular techniques such as carotids venous and arterial doppler, and echocardiograms. This painless procedure provides a view inside the body without surgery or x-rays, using magnetism and radio-frequency energy and giving your physician information he/she couldn’t obtain with traditional imaging technology. Our MRI unit serves children and adults requiring routine MRI studies such as those of the spine, head and any soft tissue body parts. A variety of nuclear medicine studies are available in this area, including cardiac stress tests (e.g. cardiolite stress and thallium), bone scans, thyroid scans, renal scans and lung ventilation perfusion scans. 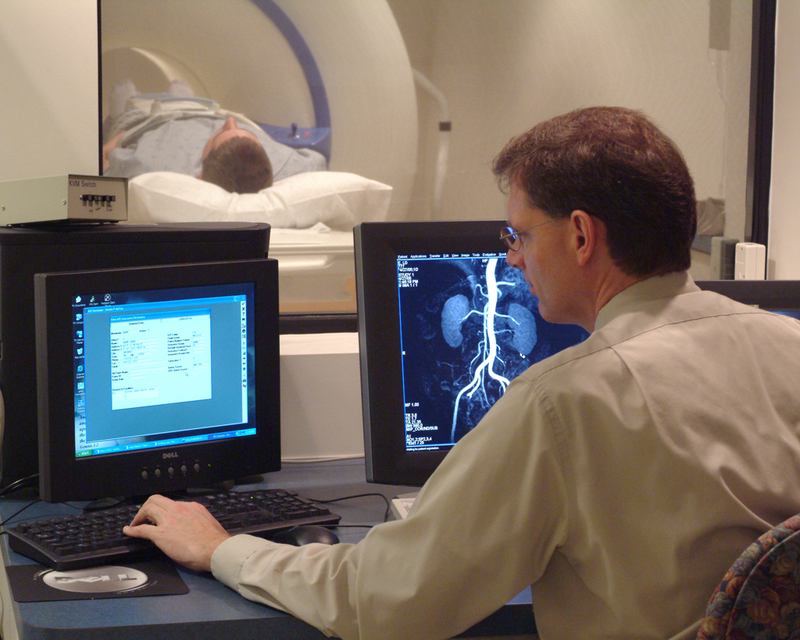 Computerized tomography allows us to view the brain, bones, chest, abdomen, spine and other areas of the body. Our new state-of-the-art unit reduces scan time and enhances patient comfort. It also greatly improves the quality and contrast of the image. At Fulton County Health Center, our CT unit includes scans, biopsies and 3-D reconstruction. The mammography facility performs both diagnostic and screening mammograms. Diagnostic studies are performed when there are indications of a breast problem (i.e. suspicious lump) and must be ordered by a physician. We also offer new procedure called Mammotome. This procedure involves a biopsy in the radiology department and avoids a surgical procedure in many cases. Mammotomes can also be used in conjunction with ultrasounds. One in three women over age 50 has osteoporosis, often resulting in hip and other fractures. If osteoporosis is detected early, changes in eating habits, an increase in exercise, and/or the use of medication can help slow its progression. Until recently, x-rays were the only way to detect osteoporosis and associated bone loss. But by the time the disease showed up on an x-ray, 25 to 30 percent of the patient’s bone density was already lost. Bone densitometry can identify individuals at risk for osteoporosis at an earlier stage than was previously possible. This simple, comfortable procedure takes only a few minutes to complete and it can help prevent years of debilitating bone loss. For more information on any of the above imaging services, call the Fulton County Health Center Radiology Department at 419-330-2651 or email us at info@fulhealth.org .